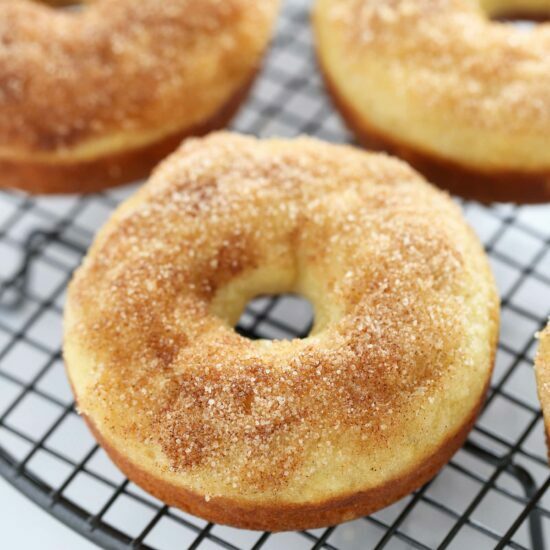 Maple Cinnamon Sugar Baked Donuts take less than 30 minutes to make and are lightened up with yogurt. Perfect quick & easy fall treat! Taste: These donuts have a lovely warm sweetness thanks to the cinnamon and maple, unlike some donuts (cough, Krispy Kreme, cough) that just taste sickly sweet. Texture: Despite being baked from a batter, these donuts still manage to be light and fluffy. Ease: VERY simple, much more simple than even the first step of any yeast-based donut recipe that requires deep frying. Appearance: Who doesn’t love food that is geometrically perfect and sparkling with sugar? Pros: Way easier, healthier, and just as tasty as fried donuts. Cons: They are best eaten the day they are baked, so no leftovers. Would I make this again? I’ve already made these donuts twice! Even though I love the aroma and taste of cinnamon year-round, there’s nothing quite like that spiced sweetness in the fall. 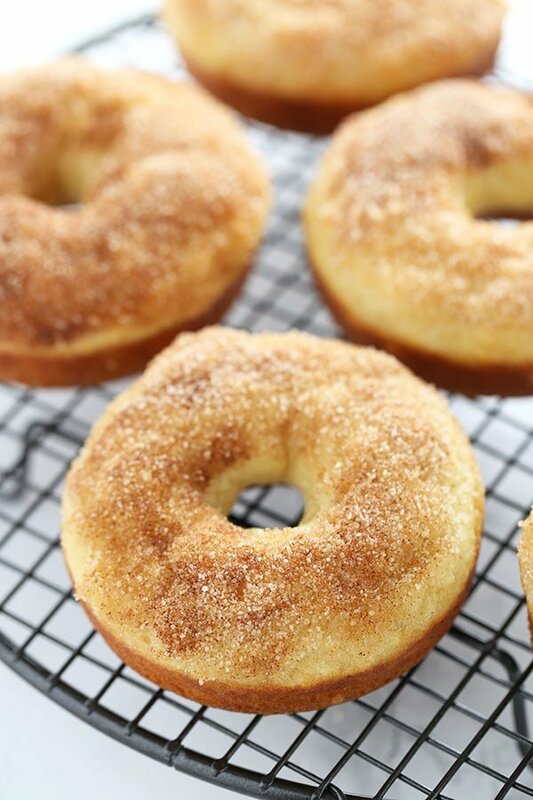 So these Maple Cinnamon Sugar Baked Donuts hit every mark for a delightful fall treat. 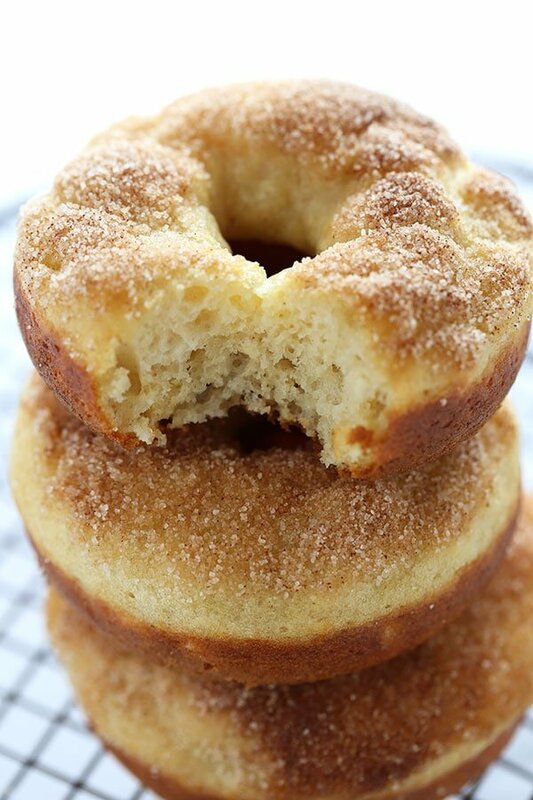 Not only are these Maple Cinnamon Sugar Baked Donuts a perfect fall treat, they are particularly fabulous for breakfast. The donuts themselves use yogurt instead of a ton of oil for richness, and maple syrup instead of refined sugar for sweetness. Then they’re dipped in cinnamon sugar for that burst of flavor and crunchy texture. My favorite part about them is that they take just 30 minutes from start to finish. Of course, they don’t quite have the same amazing texture as yeast-raised donuts that are fried, but they’re so much quicker and easier. And no mess to clean up after! You will need a donut pan to bake this recipe, which is less than $10 on Amazon! (This post was originally published in September 2010). Preheat the oven to 400°F. Coat a 6-cavity donut pan with nonstick cooking spray. In a large bowl whisk together the flour, baking powder, baking soda, and salt. In medium bowl stir together the egg, yogurt, vinegar, oil, and maple syrup. Make a hole in the center of the dry ingredients and pour the wet ingredients into the hole. Gently fold everything together until combined. The batter will be thick. Scoop batter into a piping bag or ziploc bag, snip a bottom corner with scissors, and squeeze out the batter evenly into a donut pan. Bake for 10 minutes or until golden brown. 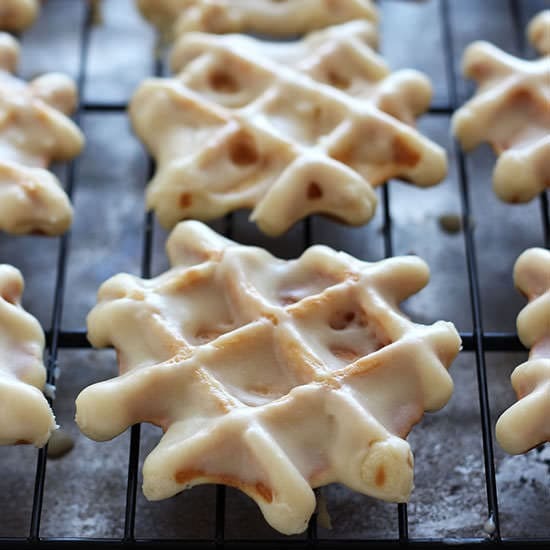 Let cool for a few moments and then flip over onto a cooling rack while still warm. In a small shallow bowl, combine the sugar and cinnamon. 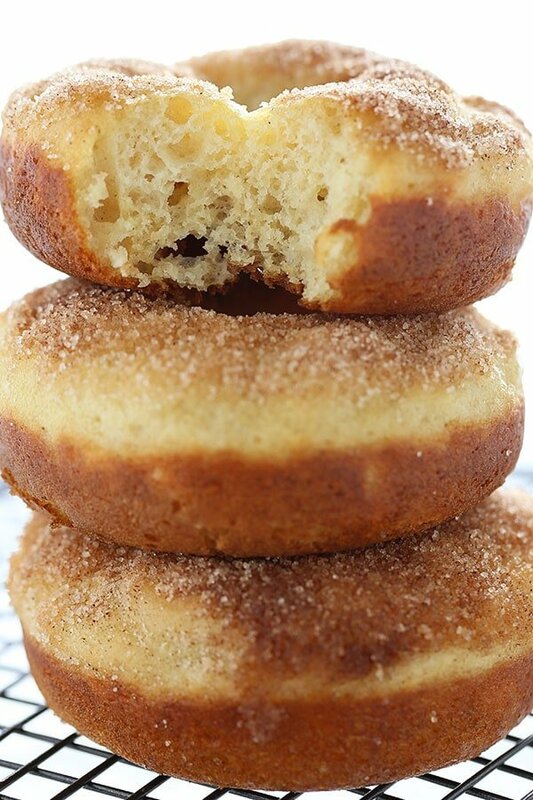 Use a pastry brush the melted butter over the donuts then dip each donut in the cinnamon sugar mixture to coat. Serve soon after coating with cinnamon sugar mixture for best texture. What a great pic of the donuts. Glad you like them. Don't be afraid to add more maple syrup! Doughnuts are an all time favourite. I have never baked them before but they sure do look good. I am bookmarking this fro sure. Lovely post…. in our home, we LOVE doughnuts! and just yesterday, I received two mini doughnut pans. This recipe comes just in time for Sunday morning breakfast! Oh how I love donuts, especially maple-flavored ones! And I can't agree more about *some* being way too sweet. Gotta make these! This is reason number ONE why I need a donut pan. To ring in fall with these beautiful donuts! Delicious. Sorry to be the first to give you a bad comment but, cinnamon and maple? Are you insane? You are killing the maple flavor with the cinnamon. Nice photos though. Cornelius- Thank you for your sweet comment 🙂 I agree about the flavor combination! But then again… everyone has different taste preferences! is there sugar in the batter and the cinnamon sugar mix? i must have done something wrong? Amanda – I just took a look at your blog post about these donuts. It looks like you accidentally overfilled the donut pans. Too much batter could also be the reason why your donuts where mushy. Did you use a ziploc bag to distribute the batter like the recipe suggests? You have to be careful to not overfill and to wipe the edges around the donut pan clean so that there is a distinct donut-hole when they bake. Also, there is no sugar in the donuts themselves since the recipe calls for vanilla yogurt which is already sweetened. Hopefully this helps you out because I really enjoyed my donuts and they were anything but mushy! 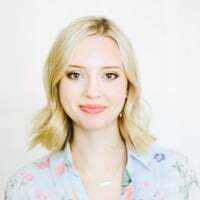 I just discovered your wonderful blog! 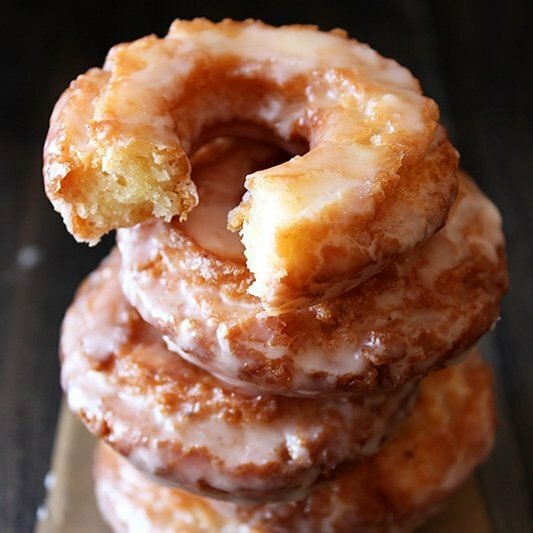 I happened across it via Tastespotting, looking for baked donut recipes! Thanks for sharing the recipe! Carly. Donut pans were on my Christmas list and Santa delivered :)I had been wanting to use them, so I did an online search for a good recipe. I came upon your Blog in my search and tried making these the same night. My 3 1/2 year old helped me and they were quite the hit. We loved them…thanks for sharing! Hi! 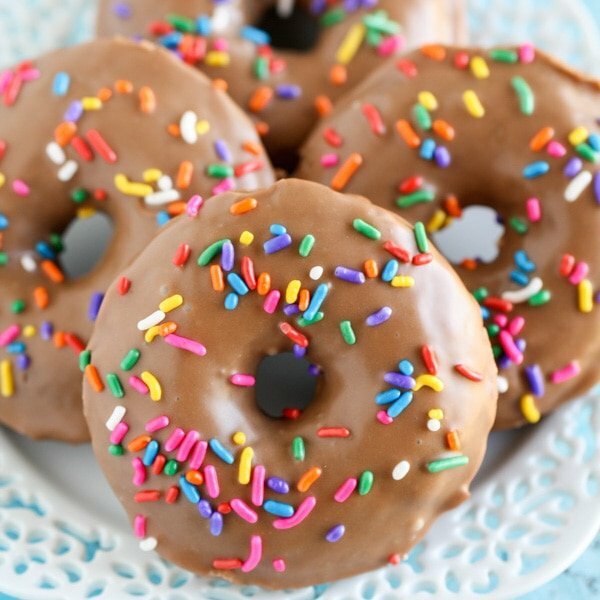 Found you on tastespotting – I want to make baked donuts for work, but I get to work by 6:30 AM (yay nursing). What do you think about making the donuts the night before, but warming them in the morning/putting the topping on? Will the donuts themselves keep well as long as the topping isn't put on until the last minute? i'd love to make these but i don't have a donut pan… do you think the dough is stiff enough to hold it's shape on a baking sheet? Which donut pan (brand) did you use? I am deciding between buying a norpro or wilton. Your donuts look delicious! I didn't have a donut pan and did not want to wait so I made them using tin foil donut cups = ) They were not as pretty as these, but still very delicious. I have now added a donut pan to my long list of cooking gear I need!! Thank you for posting these recipes they are wonderful! Ph great! I need to learn how to handle my new convection oven to bake now? Any hints? I'm going to have to make these for my mom. She'll love them! I love this recipe! Last Christmas I made a huge batch of these and included it in a special gift box of baked goods for my in-laws and my brother and his family. My sister-in-law would not stop raving about these donuts. She couldn’t believe they were baked, thank you so much for this recipe. I plan on making it this evening for dessert. I made your maple syrup donuts, they were yummy, but was now quite sure if I used the correct amount of yoghurt. Quick question – in your ingredient list, you mention plain yogurt. In one of the comments, you say the recipe calls for vanilla yogurt. Which one is correct? This recipe looks both easy AND delicious, so I want to make sure I have the correct ingredients. Thanks! Nothing better than a hot donut! add maple cinnamon sugar, yum. The recipe looks amazing! I’d love to try the recipe using a donut pan for mini donuts. How would you adapt the recipe for a 12 cavity mini donut pan? I don’t have a regular size donut pan but I do have pans for mini donuts, do you think it will work, if so, how long should I bake it? These were great! I made them twice, the first time they were much too big, and this time, I made them raspberry. So good! I know this recipe was published n 2010, but should I buy the vanilla yogurt (mentioned in comments) or plain, (written in the recipe)? I’m going shoping this week and plan on making them. Looking forward to it. Thank you.